A Makeup & Beauty Blog – Lipglossiping » Blog Archive Courgette "spaghetti". My new favourite thing! 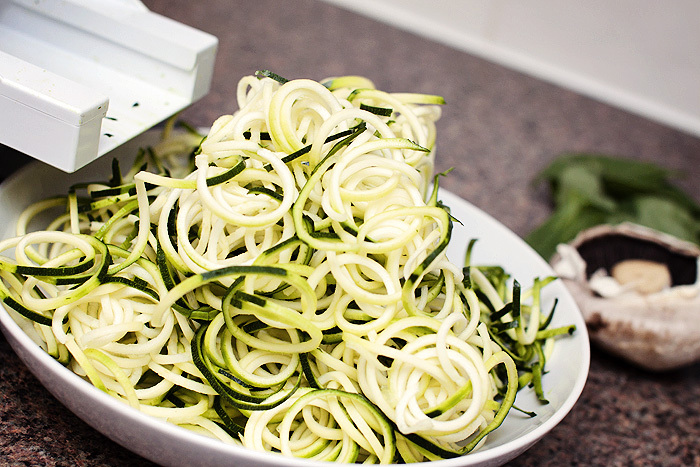 Courgette “spaghetti”. My new favourite thing! I pre-warned you earlier in the week that I’d be blogging about my new favourite thing: courgette spaghetti, and here I am! I’ve always liked courgettes but they’re one of those vegetables that don’t really serve a huge amount of purpose aren’t they? I mean, sure… they’re alright skewered and barbecued and they make a mean fritter but they’re not the kind of vegetable I ever “add” to other meals as a bulking ingredient. I have to specifically plan a meal around them, and that sometimes means that I have courgettes littering up my salad box at the end of the week. A few months ago, I bought a spiraliser. It was an impulse purchase that in honesty, I regretted almost immediately. 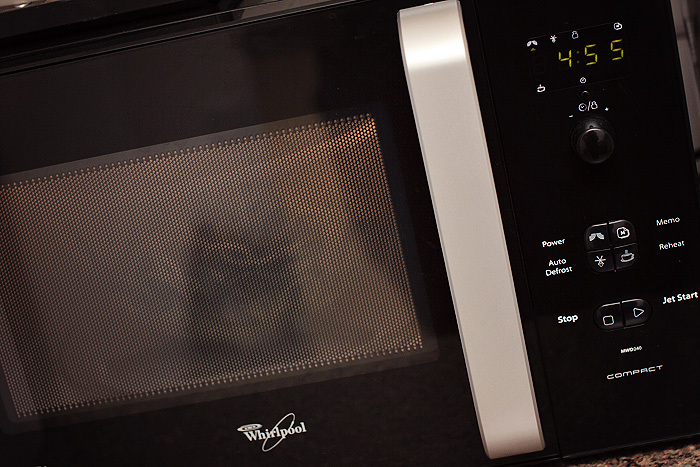 When it arrived and I saw how bulky it was, my regrets deepened and I resigned it to the back of the cupboard until I’d had a chance to get my head around what to do with it. 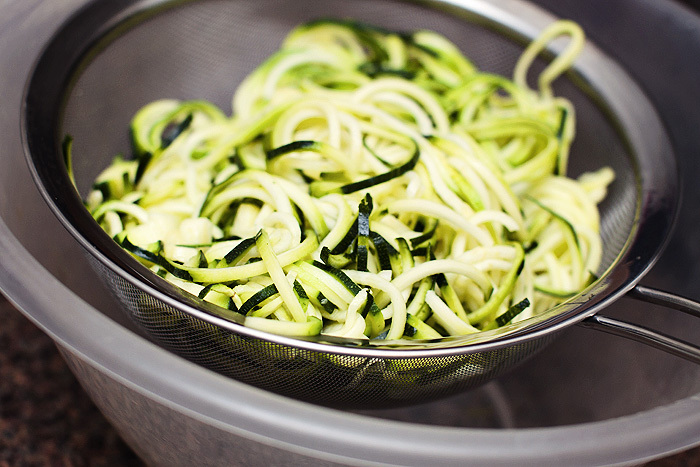 I knew that one of the most popular dishes to make with a spiraliser was courgette spaghetti… raw. I didn’t fancy eating it raw but it did encourage me to substitute normal pasta for a trial. Once tasted, I was hooked! The cast of characters. 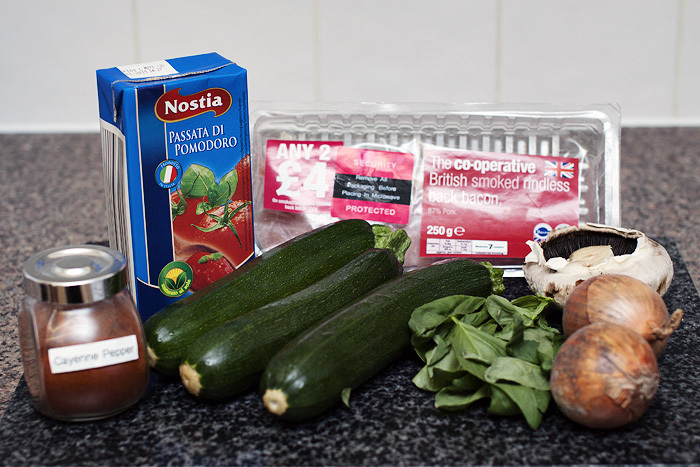 You’ll need (for two people): three courgettes, fresh basil, two onions, a few mushrooms (or one big flat! ), 1/4 tsp of cayenne pepper, passata. I also used frozen peppers and frozen garlic (not shown above). You can add some ham or bacon… as you can see, I was going to, but Mr. L decided he wanted the last two rashers saved for a bacon sandwich on Sunday morning! 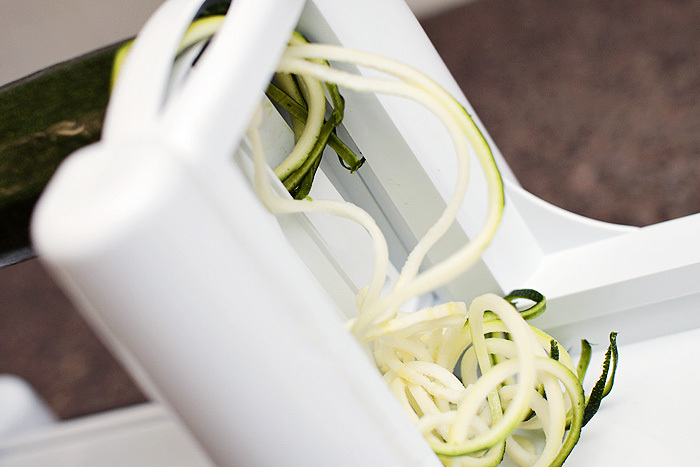 Cut the ends off your courgettes and grab your spiraliser (this one is mine). If you don’t have room for one of these beauties, you can also buy a julienne peeler which will help get the spaghetti shape. I have to say though, the spiraliser is far too much fun! You know you want a go. I sprinkle my courgette with a little salt and blast in the microwave on high for five minutes. This softens the vegetable and encourages it to release some of its water content. 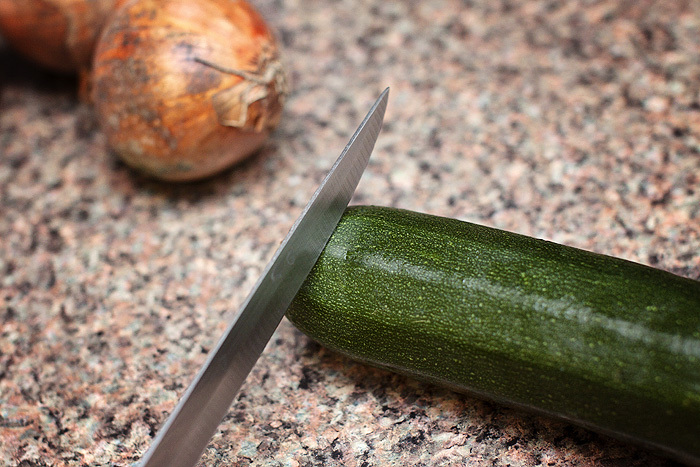 Once it comes out of the microwave, tip the courgette into a sieve and let it drain the excess water. If you have a potato ricer, you could squeeze out the excess water using that. Don’t worry too much though, if all else fails, you can cook the “spaghetti” a little longer on the hob until the excess water evaporates. 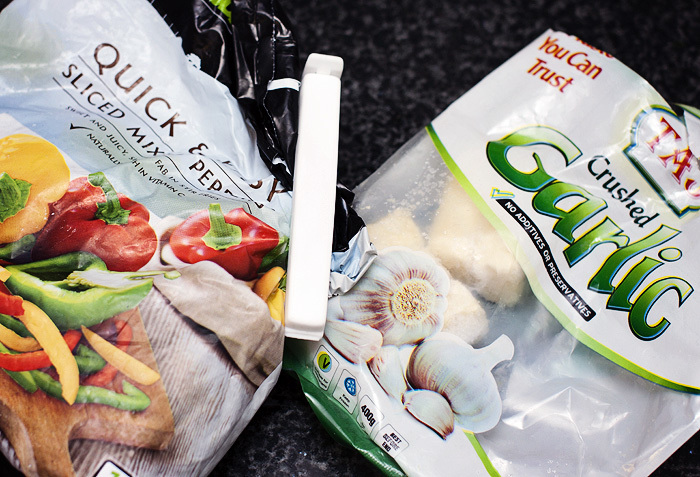 My freezer essentials include a bag of frozen peppers (how expensive are fresh?! 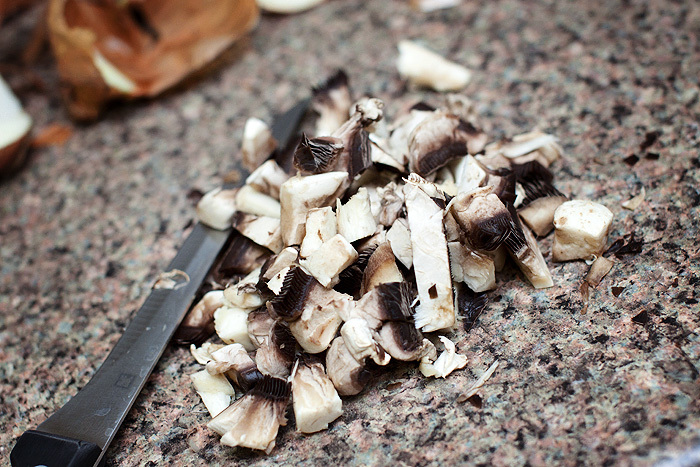 ), and frozen minced garlic that I can throw straight in the pan. Convenience at its best. 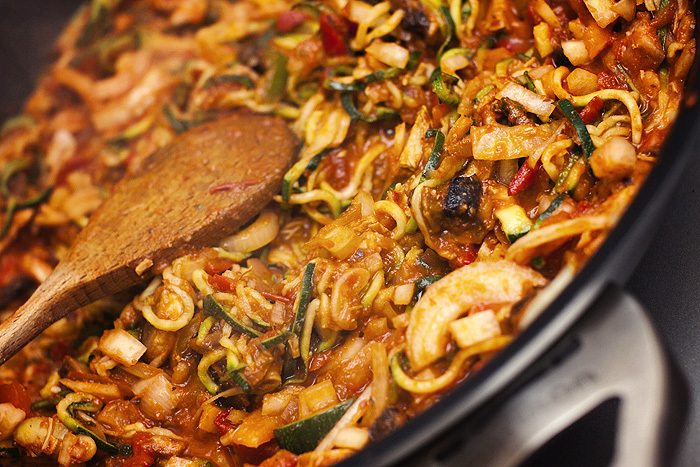 To a lightly oiled pan, add the: onions, garlic, frozen peppers, drained courgette and mushrooms. Sprinkle over the cayenne pepper and allow to fry for five minutes. Pour over the pasatta and simmer gently until the liquid reduces. Around 5-10 minutes. 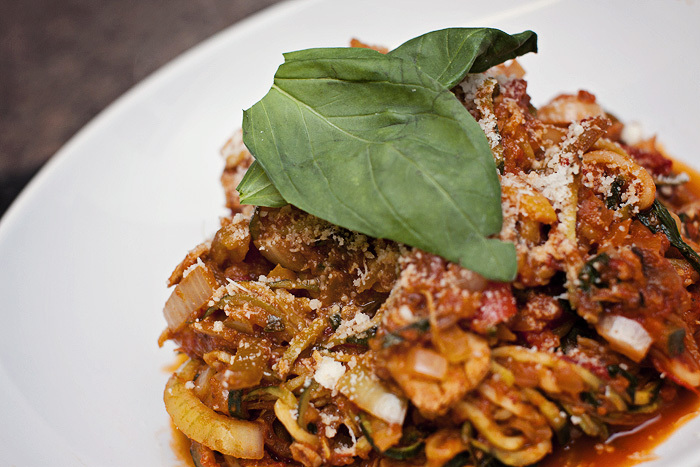 Tear the fresh basil by hand and add to the pan a few minutes before serving. Serve with a sprinkle of parmesan. So much fresh flavour and very filling. It’s also a perfect dish to make on a work-night, even quicker if you buy a pot of marinara-esque sauce to throw over the top. I’ve bought one of these to try with it next week. But do you know perhaps my favourite thing about this dish? The entire meal is 2 ProPoints on Weight Watchers (without the bacon), leaving plenty of points for a big chunk of garlic ciabatta or dough balls. 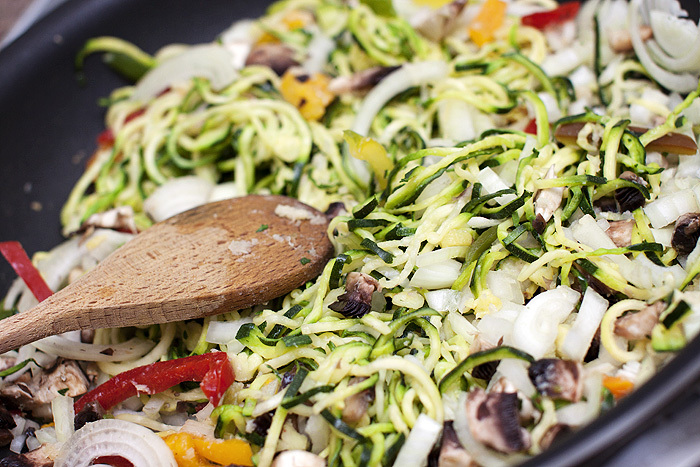 Have you ever made vegetable spaghetti? If not, I dare you to try it! 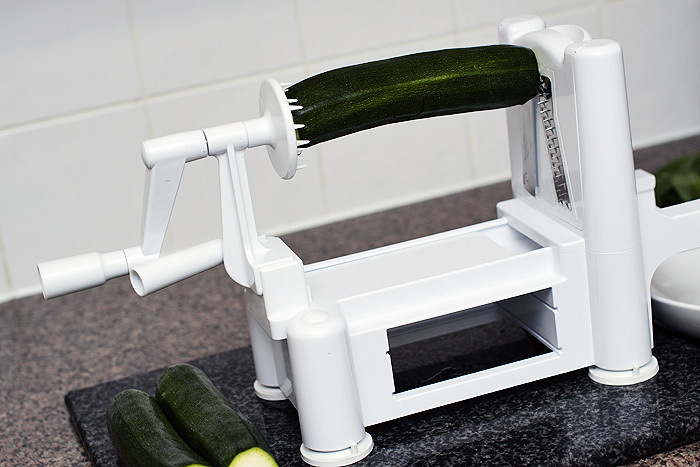 I wrote about this this week as well.I have named it courgetti – the spiraliser makes it a much nicer shape though. Yes, how expensive are peppers! I didn’t even think to look for frozen ones! This site is great. Make up and kitchen gadgets I’m addicted to both. Didn’t know about frozen garlic must look for that. Hope you are feeling much better now. God that spiralthingy looks like so much fun, and so many possibilities. I really, REALLY want one now. Plus my Mum is on that 5:2 diet and I’m sure she’d appreciate a portion of cheaty spaghetti. Thanks for the delicious tips! This is amazing. You have shown how a delicious meal can be whipped up easily even for someone who can’t cook properly like me is tempted to try. Keep the recipes coming. :-) cheers! 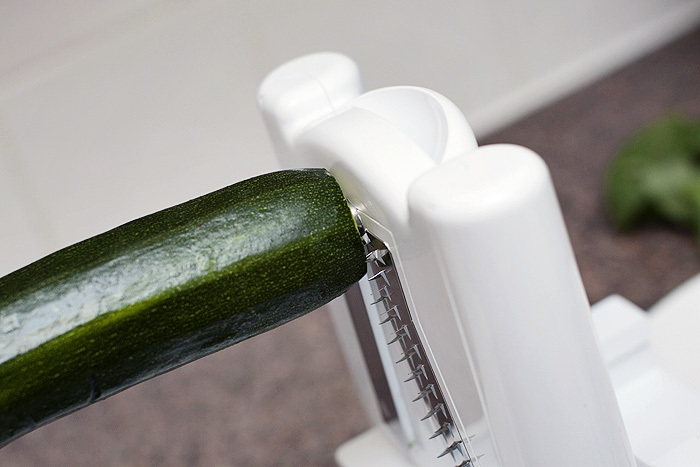 I love courgette – it’s great in cakes too! I’d like this, it’s a bit like ratatouille without the aubergine. Always a bit stuck with what to do with courgettes. I think courgetti is a great name for this as well. Hey, you can shove courgettes in anyfink. I put them into rice dishes, noodles, pasta, sauces.. I am enamoured with this idea though, just need to get that whizzy thing and I can start making pasta. 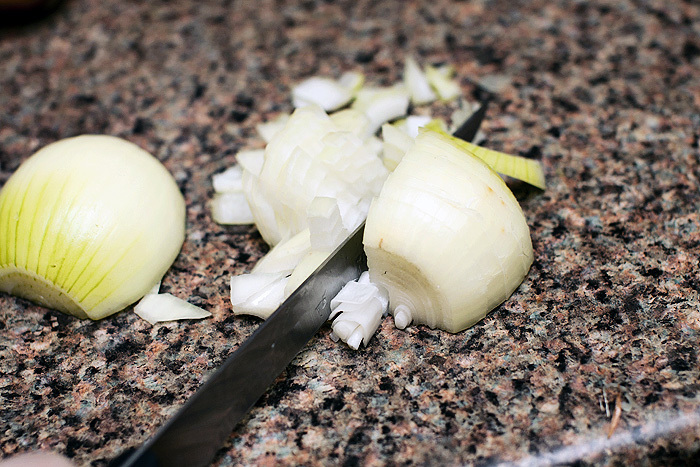 Do you think you could do the same with a peeler? Or does it have to be super thin?